NO COMPENSATION will be paid to residents of USJ One Avenue in USJ 1, Subang Jaya, whose cars have been damaged in a flood at the condominium’s lower ground car park last week. The decision was made by the developer in a meeting with residents’ representatives. Last week, more than 200 cars were damaged when the basement car park of the condominium was flooded during a downpour. Recalling a nightmare: USJ One Avenue residents at the meeting looking at the images captured during the flood. Developer MCT Berhad instead offered a relief fund of RM250,000 to the Joint Management Body (JMP). MCT representatives also gave technical and legal explanations why compensation will not be given. The residents said such an incident should not have occurred in a premier development. The meeting saw the residents’ committee chairman leaving the meeting. Another residents’ representative, who refused to be named, said the developer had to shoulder a great deal of responsibility now. “There were no precautions taken even after the first flood last year. “The second is worse and we demand measures to prevent floods,” she said. Resident Fakrul Azuan Hashim said he was disappointed with the result of the meeting. “This is not the first time such an incident had occurred but the management has not taken any preventive action. “The developer’s ability to provide good service and management to the condo buyers has been questioned,” he said. Another resident Gerald Lee said the developer was avoiding their responsibility. “I am disappointed with the outcome as we believe that the developer should pay compensation for negligence,” he said. 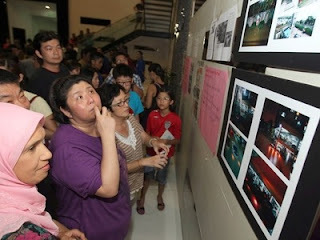 A Facebook account addressed www.facebook.com/usj1avenuecondo was set up for the residents to raise their opinions and concerns on the management of the condominium.